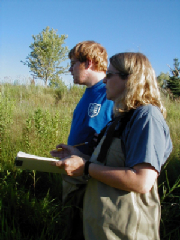 The Index of Biological Integrity, or IBI, is a scoring system used to measure strong responses to human disturbance, or pollution, in wetlands. In our sampling we focus on two biological communities: plants and macroinvertebrates (small organisms in the water without a backbone: insects, leeches, snails, etc.). The Minnesota Pollution Control Agency selected a variety of metrics or measurements for us to use. The metrics focus on those organsims which best reflect wetland quality or health. Each metric is evaluated based on the identified specimens and their abundance. They reflect organism presence and relative abundance. Depending on the result of the metric, each is awarded a score of one, three, or five. The scores for each metric are then combined to calculate a total score, this is the IBI. The higher the score, the higher the likelihood of a healthy wetland. The IBI score is then converted to an overall rating to give the wetland a qualitative description we can all understand (Poor, Moderate, Excellent). A wetland described as Poor would have a minimal variety of organisms and a large number of them would likely not be sensitive to pollution. A wetland of Excellent quality would have a higher variety of organims and contain those species that are more sensitive to human disturbance or pollution. It should be noted that the two IBIs (macroinvertebrates and vegetation) have slightly different ratings based on the scoring range. This is due, in part, to the number of metrics evaluated in each IBI; six for the macroinvertebrate, and seven for the vegetation IBI. For a complete list and description of the metrics used in the Macroinvertebrate and Vegetation IBIs please refer to the links below.